June 7 marks 40 years since voters in Dade County, Florida stampeded to the polls for a special election, one centered on stripping away critical non-discrimination protections from gay, lesbian, and bisexual people. The ballot fight, one of the earliest on LGBT non-discrimination in the country, was a flash point for the movement, sparking a national conversation that has evolved dramatically and shifted overwhelmingly in favor of the belief that LGBT people should be protected from discrimination in employment, housing, public accommodations, and more. On January 18, 1977, the Dade County Commission joined more than two dozen municipalities nationwide in passing a local ordinance to prohibit discrimination based on sexual orientation in employment, housing, and public services. 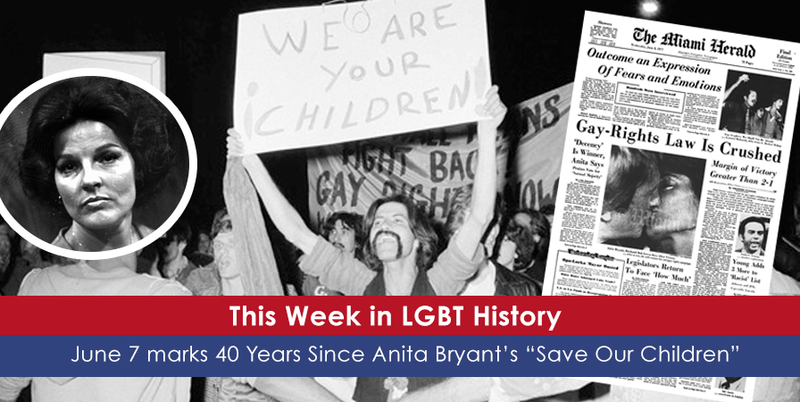 But almost immediately, entertainer Anita Bryant launched a hateful, homophobic, and fear-mongering crusade, which she called the “Save Our Children” campaign. Over the next six months, Bryant and others forced the non-discrimination ordinance onto the ballot, and when votes were case on June 7, 1977, the ordinance was repealed by overwhelming margins. The Dade County vote was one of the earliest events to spark a popular conversation on LGBT non-discrimination, elevating the conversation to a national level like never before and also preceding several other ballot fights that resulted in losses for the LGBT community. Since then, the conversation has evolved dramatically, with a supermajority of Americans now fully in support of LGBT non-discrimination. Many municipalities have since voted in favor of non-discrimination protections at the ballot. Nineteen states have comprehensive LGBT-inclusive non-discrimination laws. And federal courts are increasingly coming to the legal consensus that discrimination based on sexual orientation and gender identity should be prohibited. In Florida, the LGBT movement has greatly recovered, too. In 1990, Palm Beach County became Florida’s first municipality to protect city workers from discrimination on the basis of sexual orientation. And in 1998, Miami-Dade County ultimately reinstated non-discrimination protections, adding gender identity and expression in 2015. These local ordinances – and the dozens of others passed in the 2000s, build momentum toward statewide legislation. Last year Florida lawmakers held the first-ever hearing on the Competitive Workforce Act, which would establish LGBT-inclusive non-discrimination protections across the Sunshine State. Freedom for All Americans is proud to work with our partners at Equality Florida and SAVE to build momentum for LGBT non-discrimination statewide. Unfortunately, opponents of non-discrimination are beginning to perpetuate harmful lies similar to those the Save Our Children campaign waged in the 1970s, but now focused on transgender people. Clearly, we’ve come a long way – but the work’s not over. In most states, LGBT residents lack critical non-discrimination protections and are vulnerable to discrimination in housing, employment, and public places. Legislators across the country – including in Florida – should update nondiscrimination law to include LGBT people. We must continue this vital work and shore up support and understanding for LGBT people so that no one faces discrimination because of who they are or who they live, in every state. Learn more about the fight for LGBT-inclusive non-discrimination protections in Florida.